When using an electrical appliance basic precautions should always be followed. Do not leave appliance when plugged in. Unplug from mains when not in use and before servicing. Close attention is necessary when used by or near children. Use only as described in the manual with the machine. Use only manufacturer's recommended attachments. Do not use with damaged cord or plug. If appliance is not working as it should, has been dropped, damaged, left outdoors, or dropped into water, return it to Rug Doctor or to an authorised service centre - click here for your nearest service centre. Do not pull or carry by cord, use cord as a handle, close a door on cord, or pull cord around sharp edges or corners. Do not put any object into openings. Do not use with any openings blocked; keep free of dust, lint, hair and anything that may reduce air flow. Do not use to pick up anything that is burning or smoking, such as cigarettes, matches or hot ashes. Do not use without filters in place. Connect to a properly grounded outlet only - see "Earthing Instructions" below. Use only on surfaces moistened by the cleaning process or small spills. Do not place machine in standing water or try to clear flooded areas. Do not clean over floor electrical outlets. Do not use without upper (white) tank in place. This appliance must be earthed. If it should malfunction or break down, earthing provides a path of least resistance for electric current to reduce the risk of electric shock. This appliance is equipped with a cord having an equipment-earthing conductor and earthing plug. The plug must be plugged into an appropriate outlet that is properly installed and earthed in accordance with all local codes and ordinances. DANGER: Improper connection of the equipment-earthing conductor can result in a risk of electrical shock. Check with a qualified electrician or service person if you are in doubt as to whether the outlet is properly earthed. Do not modify the plug provided with the appliance. If it will not fit the outlet, have a proper outlet installed by a qualified electrician. This appliance is for use on a nominal 230-240 volt circuit, and has an earthed plug. 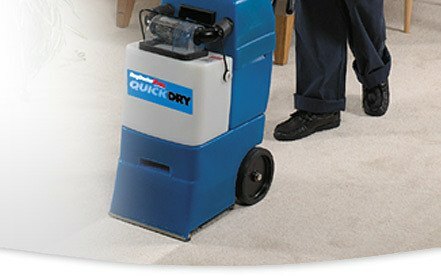 When using the Rug Doctor Pro extraction machine, care should be taken to ensure that the power cord is not damaged by sharp objects, excessive bending, pulling or pinching. When cleaning task has been completed, the power cord should be stored by wrapping it around cord hooks on the handle. Tuck the plug between the layers of cord. All servicing of Rug Doctor Pro machines should be performed only by Rug Doctor Pro or one of our authorised service representatives. Please Note: Our blue Rug Doctor Pro machines are unauthorised for rental use. For more information contact our customer services 01903 235558.